So I'm still on my black and fringe binge, but at least I added some fun to it! So I added this super fun and bright kimono to add some life to the outfit. Kimonos are huge this season and I definitely had to have this one when I saw the pattern (and the fringe, always the fringe). I liked how it was more of a formal outfit with all the black and the heels. 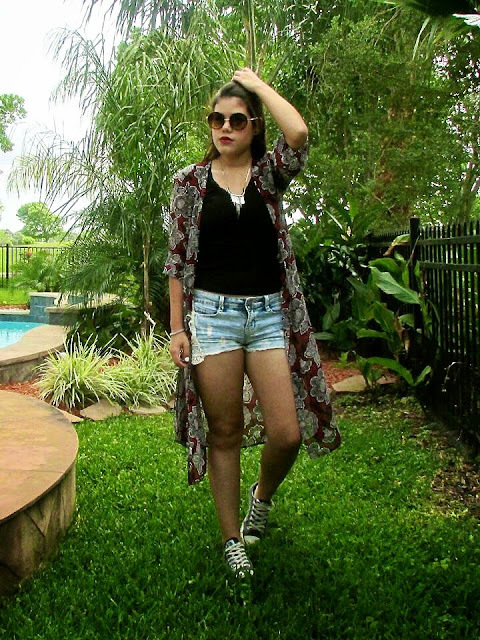 I collaborated with the lovely María from ChicPineapple to bring you this post, if you head over to her blog you'll find a post on how to style your kimono for a more casual look. She has a great style and you should follow her blog! You can also follow her on Instagram @chicpineapple.